This article is meant to help seasoned hockey players add more speed to their slapshot. If you are new to hockey, you may want to read how to take a slapshot, practice a lot, and then return here. The legs are the first place you go for power. Set the shot up, wind up, and then push off with your back leg. This is how you begin to transfer weight. Your arms do a lot of work in the slapshot, but your shoulders are attached to your arms, so you might as well invite them to the slapshot party. When winding up make sure you rotate your shoulders away from the net, then, like a coiled spring, rotate back toward the net as you shoot. Your shoulders should work with your arms and core muscles to provide a lot of the power in the slapshot. hits the puck. Then continue to drive through the shot for more power. When the blade hits the puck a lot of that potential energy will be released onto the puck. I find a stiff stick works a lot better than a whippy stick (but only if you can properly flex it), a lot of the potential energy is lost with whippy sticks. I made a video to show you some tips that have helped me improve my slapshot power, I also have made a quick list below the video. Rotate your upper body, and use strength from your shoulders and core muscles to add power to the shot. These tips should help you understand how to get more power from your shot, and maybe improve a few things you could have been doing wrong. If you have any slapshot tips be sure to add them in the comments section below. Hi Jeremy, all the videos are really nice and I have seen my shot improve greatly. However, my dad and I are debating whether to slap the puck more on the toe end or toward the base. Another issue is that when I take slo-mos of my shot on the iphone, I notice that my blade always flips up when I hit the puck and the shot is low and lousy. Where should I hit the puck, and how do I cure “stick flip”? Is it good to slapshot off from the heel of the blade? I tried it and suprisingly gives you more power………..is it good? I am 12 turning 13 i want to play so bad but my parents don’t have the the money i play roller hockey with my friend just messing around and wasting time.u forgot one thing you always do before hitting a puck.”feet square hip in-line with your feet. i don’t have money for a speed radar right now in fact i need new skates because the front 2 wheels on my old ones i actually wore off. so my question is how do i get a sponsorship or where do i go? How much money do you need you think? Hi there! is it the toe of the blade that hit the ice first in slapshot? what’s the different with mid blade part? Also right at the contact with the puck, do we snap the wrist quickly like in wrist shot or just rotate and point it? In varsity hockey video, they said that player must mastering the wrist shot first before learning slapshot. what’s ur opinion on this? ivan u kinda snap your wrist a little but not much so 50/50! Hitting the ice first with the toe can increase the flex on the stick, but it happens naturally and isn’t really something you should force. The slapshot is such a quick shot that rolling the wrist and pointing is very similar to snapping the wrist. I agree that learning the wrist shot first is very important, it should be the first shot that any player learns. yes but try to push down a little more on the stick and it will come out like u want it ! Even at 11 you should be able to flex the stick, you just need to get a stick with the right flex in it. There are junior and intermediate sticks that should help, but you may have some trouble with a wooden stick. You will still be able to get off a good slapper with a wooden stick, but the flex can not be manufactured as well as with the composite sticks. 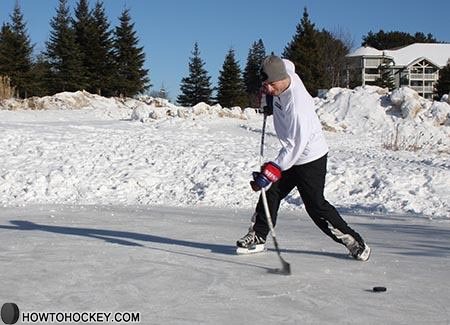 For younger players I recommend just hitting the ice about an inch behind the puck. Good job on the rip in the net! Great stuff! When I teach my son the slapshot, I add one other aspect that you don’t cover, but which I believe adds tremendously to shot power – torque. The stick actually stores potential energy to two ways- bend and twist. The bend part, everybody understands, because it shows up in photos. But the stick can also twist if you contact the ice with the toe end of the blade. The untwisting of the stick adds that much more power to the shot. There is probably some torque in any shot, unless you contact the ice directly with the heel, but moving the contact point out to the toe increases the contribution of torque. To do this, you postion the puck closer to your feet. You also have to adjust your grip to a more “closed” position or you will be shooting off to the right as the blade opens on contact. I think good shooters do this instinctively without knowing what they are doing, but you can play with it a bit to see if this makes sense. Try moving the puck in and out from your feet and note the effect. we have not yet read the whole article but looking forward to it. It has a lot of imformation for a better slap shot and shot over all. We will soon read the rest of the article at a later date. Good talking to you yesterday at Muskoka outfitters. this is an excellent video. I took his advice of keeping my hand further up and pushing my shaft more into the ground/ice and I got great results. You have to be wary to not push too hard or too fierce or you will quickly ruin your stick. If you find your sweet spot you are golden. Previously I was kinda swiping the puck too much instead of loading up the shaft before hitting the puck. I had a good slapper, but this took it up a notch. I still have to practice this technique a lot more to do it right constantly on every slapper I take but it feels great to see the puck rocket off the blade like it did yesterday. Another benefit with this technique is the lessened effort it takes to get a good shot off. Better balance (since my hand is higher up on the shaft, closer to my natural stance) and less required strength from your body (loading the shaft will generate the power). There are a few tricks for getting the puck up high. Having the puck a bit further ahead in your stance helps. The biggest one would be following through high. The best way to learn is to lay off the power and just focus on shooting top shelf. As you get the feel for going top shelf with your slapshot, then add some power. Remember though, keep it low when people are in front of the net. We have an article coming up talking about slapshot accuacy. how do you get it high do you have to flick your wrists because i have the power i just cant get it up what do i do?? Haha, thanks, but it takes a lot more than a good shot to make the N! Plus pro’s can get over 100MPH on the ice. I want to get mine up to 90 on the ice so I can share with everyone how I did it.